This course is suitable for the complete novice. 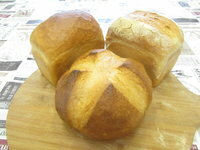 During this course you will create both White tin loaves and White oven bottom crusty types. You will learn how to use your senses to judge when the doughs are mixed, fermented, proved and baked. You gain moulding skills from a real baker that allows you to create bold and shapely loaves with good crumb structure. We will keep you topped up with drinks throughout the day, you will taste some of the breads made during the day.